I've written on a few occasions how I enjoy leading and singing hymns with the men in my Monday night bible study at the prison. Since I grew up singing hymns I know a bunch of hymns that the guys don't know. So just about every week I'm introducing and teaching them a new hymn. And sometimes these new hymns become favorites that they request week after week. Would you like to know what new hymn has become their favorite? It's a hymn that has long been one of my own favorites because of its simple, haunting, almost lullaby-like melody. I introduced it early on and it's been requested over and over. We sing in almost every week. "There is a Balm in Gilead" is a well-known African-American spiritual. As I said, I've always found the song haunting. Not sure why, I just always have. In the Christian tradition Jesus is understood to be the prophetic answer to Jeremiah. Jesus is the physician and the medicine for our healing. 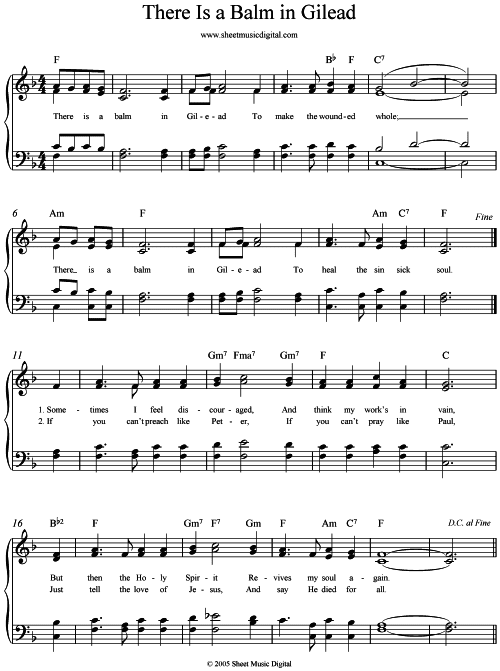 Yes, the hymn confesses, there is a balm in Gilead. 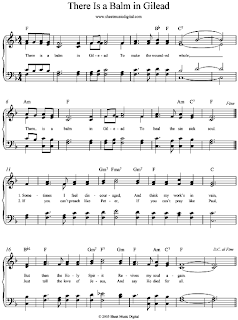 2] Having been trained by the almost-daily news reports of terrorism in our world, every time we sing this song, my ears hear, "There is a bomb in Gilead". However, if the song blesses you and your group, I bless Yah that this is so. There is a balm for your (personal) problem.